I am writing this letter on behalf of my friend Shakiyl Smith. He is 21-years-old and he really needs your help. Four years ago, a bullet to the left side of his neck instantly transformed his life. In one horrible instant he was changed from a 17-year-old high school basketball standout into a high school quadriplegic. The victim of senseless gun violence, Shakiyl has been without the use of his arms and legs since August 2008. Shakiyl has suffered daily with headaches, infections, depression and excruciating body pains. His immobility isolates him socially, emotionally and intellectually. His family, friends and even some of the best local medical facilities are limited in their resources to help him. Though Shakiyl’s body has atrophied over the last four years, he is in a place where his spirit and mind have never been stronger. 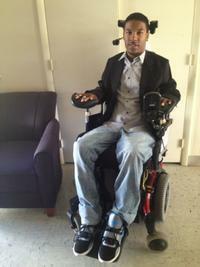 Not only is he determined to walk again, but he has publicly forgiven the unknown shooter. Shakiyl’s forgiving heart recently earned him The 2013 Dr. Martin Luther King, Jr. Community Service Award in Philadelphia. And people from as far as London, England have inquired about his non-violence efforts. Shakiyl is an extraordinary speaker who presents a strong message that helps others. But he really needs your help now. Stem cell therapy and other amazing medical advancements are now available that can help Shakiyl greatly improve his physical condition. The technology and medical knowledge that now exists could very well bring Shakiyl to his feet once again. For credit card contributions, call 1-800-642-8399 or select the DONATE NOW button. Together, we can make a difference! Thank you for your kindness and generosity.